Ladies in their spring dresses and men in casual linen suits sipped champagne and nibbled hors d'oeuvres as they waited for the U.S. Open polo match. What they ended up with was a field of death. Magnificent polo ponies, each valued at up to $200,000, stumbled from their trailers and crumpled one by one onto the green grass. Vets ran out and poured water over the feverish, splayed-out animals. But it was no use. One dead horse. Then another. Then more. And within a day, 21 horses were dead. State veterinarians were still performing necropsies but suspect the horses died from heart failure brought on by some sort of toxic reaction in their bodies. Possibly tainted feed, vitamins or supplements. Maybe a combination of the three. While polo club officials and several independent veterinarians insisted the deaths appeared to be accidental, it remained a mystery that puzzled and saddened those close to a sport that has long been a passion of Palm Beach County's ultra-rich. "The players, the owners of the horses were in tears. Bystanders and volunteers were in tears. I mean, this was a very tragic thing," said Tony Coppola, 62, an announcer for the International Polo Club Palm Beach in this palm tree-lined town some 15 miles west of the millionaire enclave of Palm Beach. Spectators at the Sunday match had difficulty making out what was happening when the frenzy of workers and trucks hovered around the horse trailers. Soon blue tarps were hung and trailers were shuffled into place to obscure their view. The match was canceled, replaced by an exhibition game, to keep the crowd busy. Rumors swirled and the death toll climbed. Some horses died on scene. Others were shuttled to clinics for treatment, but there was nothing that could be done. Their fate was sealed. All the dead horses were from the Venezuelan-owned team Lechuza Polo, a favorite to win the title at what's described as the World Series of this sport. The team included about 40 thoroughbreds in all, maybe more. The team has not spoken publicly since the deaths, but released a statement late Monday. "This is tragic news. We are deeply concerned about the death of our ponies," the statement read. "We have never encountered such a dire situation like this as our horses receive the most professional and dedicated care possible." The statement said the team does not know the cause of the deaths, but is helping with the investigation. Polo club manager Jimmy Newman said it was like losing half the New York Yankees. "They lost some great horses," he said. 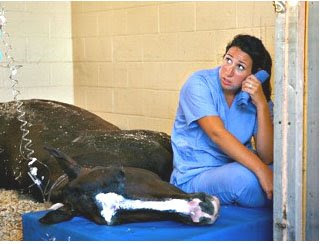 Dr. Scott Swerdlin, a veterinarian at Palm Beach Equine Clinic near the polo grounds, treated one of the sick horses. He said it appeared the animals died of heart failure caused by some kind of toxin that could have been in tainted food, vitamins or supplements. "A combination of something with an error in something that was given to these horses caused this toxic reaction," Swerdlin said Monday. It may take days or weeks to get the results of toxicology tests, he said. John Wash, the polo club's president of club operations, said doctors had ruled out any sort of airborne infection. "This was an isolated incident involving that one team," Wash said. "This was devastating," he added. "It was heartbreaking to see that many horses to get sick all at once." He said games would resume on Wednesday, with the finals taking place Sunday. The Lechuza team has withdrawn. The team is owned by affluent Venezuelan businessman Victor Vargas, who also plays, but most of the horses and players are Argentine. The team travels most of the year. This is a town of horse clubs, training facilities, stables, polo grounds and wide open fenced fields where the animals roam and graze along straight-line, neatly groomed streets. The club has hosted the U.S. Open for seven years. "It's just so incredible, so unbelievable. The reaction throughout the polo community worldwide is one of disbelief. Disbelief and grief," said Coppola, the club announcer. Although the value of the horses lost was great, this isn't a game people play for the money. The owners are already multimillionaires. "You've got to have the money to part with," Newman said. Purses rarely top a few thousand dollars, if any at all. They do it for the pride, for the glory, for the love of the game. "If you win this tournament, you get your name on a trophy," Newman said. And the respect of your peers. That's pretty much it. "It's a lifestyle." 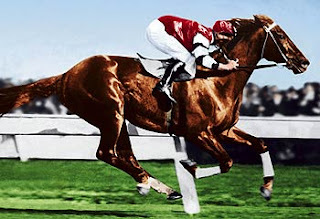 Phar Lap was a champion thoroughbred racehorse whose achievements captured the public's imagination during the early years of the Great Depression in both Australia and New Zealand. Phar Lap was foaled in New Zealand but trained and raced in Australia, and is considered to be a national icon in both countries. When he died in 1932 Phar Lap was the third highest stake-winner in the world. A chestnut gelding, Phar Lap was foaled on 4 October 1926 in Timaru in the South Island of New Zealand. He was sired by Night Raid out of dam the Entreaty. He was a half brother to Melbourne Cup winner Nightmarch. Following his purchase at the 1928 Trentham Yearling Sales (now the Karaka Yearling Sales) for 160 guineas, he was taken to Australia where he dominated the racing scene during a distinguished racing career. Standing 17.1 hands, he was sometimes called "Australia's wonder horse", or simply a "Wonder Horse". He was also called the "Red Terror", "Bobby" and "Big Red" (the latter nickname was also given to two of the greatest US racehorses, Man o' War and Secretariat). Sydney veterinarian Dr Percy Sykes believes poisoning did not cause the death. He said "In those days, arsenic was quite a common tonic, usually given in the form of a solution (Fowler's Solution)," and suggests this was the cause of the high levels. "It was so common that I'd reckon 90 per cent of the horses had arsenic in their system." In December 2007 Phar Lap's mane was tested to find if he was given repeated doses of arsenic which, if found, would point to accidental poisoning. Kempson and Henry discovered that in the 30 to 40 hours before Phar Lap’s death, the horse ingested a massive dose of arsenic. "We can't speculate where the arsenic came from, but it was easily accessible at the time," Henry said.